If ever one was lead to believe that comic books are just ten minutes of escapist entertainment, the first volume of Tales of the Green Lantern Corps argues firmly in the other direction. It's not just because the stories collected here are each in their own way thoughtful deconstructions of the Green Lantern concept -- though they are. Rather, it's because there are concepts introduced in this book that are still in use thirty years later -- letting alone writers and artists involved with these original stories who still influence the Green Lantern titles today. Comics may not yet have fully achieved mainstream status, but in this story that's continued for more than half a century, I see evidence of an unrecognized American mythology. Tales of the Green Lantern Corps volume one collects Mike Barr's three-issue Green Lantern Corps miniseries from 1981, and the Corps back-up stories from 1981 to 1983. I missed these books the first time and only came to Green Lantern shortly before Emerald Twilight, but it's amazing how recognizable the characters are in this book -- Arisia (making her first appearance), Stel, and Green Man are here (as are later deceased Lanterns Katma Tui, Tomar-Re, and Ch'p), as well as the villain Krona and the Spider Guild. It's hard to believe that thirty years later, these characters still fight beside Green Lantern Hal Jordan; it's a benefit of the comics medium that for the most part we can't see in television or in movies. The issues collected here build themselves directly on stories written previously, just as these events and characters would be used by writers later -- Arisia, for instance, continues into a number of Green Lantern Corps and Justice League books, Beau Smith's Guy Gardner: Warrior, and ultimately Geoff Johns and Dave Gibbons' Green Lantern and Corps. Some would argue that this constant reusing of characters limits creativity and story growth, but I love the breadth of the tapestry, that one can read the latest crossover or stories thirty years old and still find something familiar; the monthly relay race of continuing stories, as demonstrated by Tales of the Green Lantern Corps through to the current Green Lantern title, deserves more credit even than what it's already beginning to receive. In terms of readability, while dated, Tales of the Green Lantern Corps holds up fairly well. The three-issue miniseries is somewhat simplistic and spends much of the first and second chapters recounting the origins of the Green Lantern Corps, which will be familiar to modern readers but might not have been at that time; one bright point is that the story focuses on Hal Jordan's classic heroism in the end, as well again as all the familiar Lantern characters. 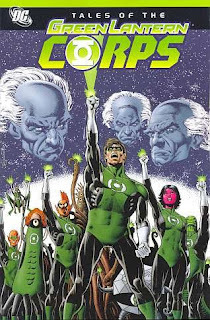 The Corps back-up stories might at one point have annoyed me given their loose connection to any main plot, but in this collection -- with the purpose of spotlighting the variety of the Lanterns -- they shine. Especially intriguing is the way each story bends the familiar Lantern concept; one story offers a Green Lantern forbidden by her culture to use violence, while two others follow Lanterns placed in forced retirement by the Guardians, something we rarely hear about today. A couple of Lanterns actually die before the end of their stories, and indeed I checked my copy of Tales of the Sinestro Corps -- all of them are there in the Green Lantern memorial spread. A few of these stories are actually pencilled by Gibbons, who thirty years later took a hand in introducing the Green Lantern Corps to a new audience (including me). Brian Bolland drew covers for the Green Lantern Corps miniseries back then, and returns to cover the new collection now. There's also stories by long-time DC editor Paul Kupperberg, and renown artist Carmine Infantino. I do wish DC Comics had included Green Lantern #163, which is the first part of a "Green Magic" series, since they include the second and third parts. The stories are not inextricably tied -- the second part explains, somewhat vaguely, what happened in the first -- but they still feel unfinished, and the third part's cliffhanger is entirely unclear. At base it's the story of a young Green Lantern from an island of persecuted magic users, and the uncommon combination of Green Lanterns and swords and sorcery makes for an intriguing combination, unfortunately left incomplete in this volume. A shared universe has its pitfalls, no doubt, but among its benefits are a sense of heritage and tradition -- Johns inherits, for instance, what Barr set up before him -- and also continuity, not in the "does Jimmy have a consistent broken arm this month?" sense, but in that a character that you read yesterday is still around today and could still be around tomorrow. If you're in to that kind of thing, I think the first volume of Tales of the Green Lantern Corps is worth taking a look. I has just deleted this (and the second volume) from my Amazon wish list, and now it looks like I'm going to put it right back on. Thanks, CE. Seriously, this is why I love your site. Here's a book I probably would not have given a second thought to. I've got a few GLC stories in "In Brightest Day" and my Alan Moore collection (which I'm sorry to see DC is cannibalizing and doling out into smaller Moore-centric volumes like the "Whatever Happened to the Man of Tomorrow?" deluxe edition), and I had been content with those. Now it looks like I'm missing a valuable piece of the puzzle - particularly because I'm a sucker for these "first appearances" collections. I'm glad (though not surprised) to hear that modern continuity builds on what went before instead of blatantly contradicting it. I know Geoff Johns takes a lot of flak for "borrowing" from the GL mythos; Alan Moore is the loudest voice in this camp, complaining that today's stories have been stolen wholesale from his writings of yesterday, but that's exactly what I love about comic books, DC in particular: this is a company that, despite minor bumps in the road, always ends up rewarding long-time readers, even if it's just with little references here and there. So that's why I'm going to end up getting this, I think - because I like being "in on the joke," so to speak. Pre 1985 is usually my cut off, but this sounds quite worthwhile and compatible with the GL books that come later. If you read In Brightest Day, I think you'll find Tales of the Green Lantern Corps Vol. 1 a good companion book. The Alan Scott/Hal Jordan story in In Brightest Day gets a mention in Tales, and the character who's resurrected in one of In Brightest Day's two-part stories (if you've read it, you know), dies in Tales -- that is, there's a lot of give and take between In Brightest Day and Tales Vol. 1. Review of In Brightest Day coming Thursday, actually. I'll have to fix the Contact link; if you want to email, my address is in the footer at right. Thanks! Most longtime GL fans (such as myself) have repeatedly pointed to the Tales fo the GLC miniseries from 1981 as the greatest GL epic ever done. And ~30 years later...it's still hard to argue otherwise. The storytelling style is a tad archaic, perhaps, but the plot and basic character beats are pitch-perfect. So it came as no surprise that in writing what is being billed as the biggest GL story of the modern era - Blackest Night - Geoff Johns is actually just telling a sequel to this story. And that is apropos. Once John broome left GL in 1970, little was done to build upon the GL mythos, as Denny O'Neil turned GL into a more grounded, Earthbound adventurer/crusader. The only significant addition to the GL mythos actually took place outside the GL series: In his JLA run, Steve Englehart created the Manhunter robots as a precursor to the Green Lantern Corps. In the story the Manhunters frame Hal Jordan for the (faked) destruction of their home planet, as a means of discrediting their former bosses the Guardians. And even today, a fair amount of what Geoff Johns has done in his GL to build up Abin Sur has its roots in this story. Here Abin is presented as a legend in his own right, one beloved by the other Lanterns - a mirror to what would happen to Jordan beginning with this story. The two are tied together by fate and succession, something Johns has built upon by adding Sinestro as another link between Hal and Abin Sur. The Englehart JLA issues you mention are #140 and 141, not collected as far as I can tell. There's a lot of hinting in Green Lantern as to why the Manhunters went crazy, and surely there's a story coming that bears the collecting of those early issues. Englehart wrote Millennium, too, that also included the Manhunters, if I understand correctly. Englehart did write Millennium, which was essentially a GL-based crossover, as Englehart was the Green Lantern (actually "Green Lantern Corps") writer at the time.